today marks the summer season giveaway finale. (more weekly giveaways will showcase near the holiday months, contact me if you have something fabulous to feature.) lady of many talents and owner of the paris house boutique, michele, emailed snapshots of this charming picnic basket & accessories to me a few weeks ago. i had to double check with her, all of this is included?! really, truly? it's such a darling set, am wishing i could keep it for myself. it would make the best wedding or anniversary gift too. pack a blanket, find a hillside and picnic with the stars. I'm Michele (aka Bunny) and am a party planner/designer. I work out of our 200 year old stone and clapboard house, where I live with my husband, three sons and a handful of pets. 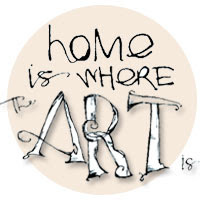 I have an online lifestyle magazine and blog that gets updated everyday with new recipes, party and craft ideas, garden tours, custom jewelry, travel and much more. Much of our designs and work are based on our travels around the world. Our philosophy is that we only have one life to live and we feel it is important to live it beautifully. I strive to surround myself with loving people, meaningful things and live each day to the fullest. My favourite dish to take on a picnic is home-rolled sushi, usually with marinated chicken and avocado, mixed peppers and cucumber fillings, though sometimes I like to go less traditional and try things like strips of grilled steak and mushroom, or smoked salmon and cream cheese! This is a really adorable and generous giveaway! I love this kit! I love to take fruit salad on a picnic. Gorgeous basket! I love to take a crisp fresh cucumber salad! This picnic set is so neat! Love it! My favorite dish to take on a picnic is pasta salad. how topical, the boy and I were discussing having a picnic this weekend. i love this! i always love to bring a fresh salad with greens and summer fruit tossed with a homemade dressing of course. My favorite dish to take is fresh fruit--watermelon, strawberries, whatever is in season! Favorite thing to take to a picnic is a bottle of ice cold white wine. Crisp - refreshing and easy to share. My favorite thing to take on a picnic is a huge assortment of fruit. We clean and chop everything, spread out the blanket and enjoy! Love this basket. Fried chicken typically plays a part in our picnics along with delicious fresh fruit. i would have to say a pan of s'more brownies are a bit of a must. mmmmmm, for sure potato salad! Yum! Crossing my fingers to win, you don't know how much I bug my husband to take me on a picnic,this would be the perfect set to make him say YES! So cute. I want! When I go on picnics I like lots and lots of fresh fruit. And peanut-butter sammies. What a beautiful set! A picnic just isn't a picnic for me without my grandma's potato salad. My favorite dish on a picnic is an elaborate sandwich - the kind I'm usually too lazy to make at home. LOVE this basket! Hopefully miss anne will choose my number!!! I would bring my potato salad. I've finally perfected my recipe and it's been a big hit (finally!). My favorite dish to take to a picnic is potato casserole...small frozen,cubed potatoes mixed with a little sourcream(which you can't taste) salt and pepper...baked in the oven with shredded cheese on top and finishing off with French's caramelized onions (crunchy)! It goes perfect with any main dish - burgers, chicken, hotdogs, or fish!!!! I love to bring a corn salad with cherry tomatoes...yum. I love picnic baskets for real and for play picnics. When the weather doesn't cooperate, my kids and I spread out a "picnic" right on the living room floor. Irresistibly fun! Good finale! I like curried chicken salad with grapes for a picnic. It's great paired with crusty bread. CUPCAKES. Especially ones w/ diamond rings decorating them like my boyfriend- err, FIANCE- used to propose 2 weekends ago. Needless to say, I love picnics... I'm crossing my fingers!! 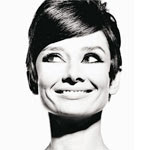 sorry, a previous comment that says it was posted by jeffrey was me, maryirene. sorry about that. I could use this to take my husband on a romantic picnic for our anniversary. Oh this is too beautiful!!! Have fun this weekend!! My favorite picnic food is a corn salsa with feta cheese and chips. So good. my favorite thing is any dessert! I love to take chips with various different types of dips. My 2yr old is really into picnics, so our are usually pb&j, fruit salad and dried veggie chips. I live one block away from Prospect Park in Brooklyn, and I have really, really wanted a picnic basket for our concerts in the park. No such luck yet. If I won this, you bet your bottom dollar I would use it daily. Seriously. We go to the park that much. I am hooked on spinach salads with goat cheese, strawberries, nuts and craisins~ Balsamic dressing~ YUMMMMMALISH!!! Perfect for picnics! The picnic set is my favorite color-red. Its so pretty. Potato salad, hamburgers, salsa and tortilla chips are favorites for a picnic. this set is so very much me. i would love to do on a picnic with it filled with salads...esp watermelon, goat cheese, adn fresh mint salad! I usually either cheat, and bring takeout pizza, or we do a finger food (cheese, crackers, fruit,)picnic for the kids, since that's basically all they'll eat. That is darling! Count me in. My favorite dish to take on a picnic is a traditional sandwich. Wow! That is awesome!!! It makes me want to go on a picnic right now!!! A favorite dish to take to a picnic would be...pasta salad with fresh broccoli and yummy little tomatoes. this is sad, i just realized that i've never been on a REAL picnic where a basket or anything was involved! if i were to go on on i think i'd pack pressed sandwiches - portable and delicious. Wow! How fantastic...I would love to pack fruit and sandwiches for a picnic with my fella. That picnic set screams FUN! My husband and I usually grab lunch at chili's and then go to the park and sit under the tree where we carved our names when we were dating. Sadly it's hard to see the initials but the heart shape is still there. Muffleta sandwiches. Dry crusty rolls, with a bit of EVOO, fresh herbs, cheese & possueto. They are not very healthy so it ends up being a special treat. I love taking something special to linger over like a bottle of sparkling apple cider or something. What a great giveaway! I love to make pasta salad for a picnic. Bowties, tomatoes, olives, cucumbers, feta...it actually sounds really good right now! hmmm, my favorite dish to bring would have to be potato salad...or watermelon. That's a gorgeous set! I don't think a picnic is really a picnic unless there's a pretty basket and set of dishes involved, and of course yummy foods, especially fruit salad! i love fruit and chicken salad. that red picnic basket is amazing, i would love to win it. My favorite picnic is a mix of hummus, good cheese and bread and crackers. How fun to read what everyone else likes to take, great ideas! I think we'll have to go on a picnic today! Oh, I LOVE that! Pick me!!! We love brie and baguettes for picnics, and can't forget the salad! Chilled Curried butternut squash soup. Wins me accolades every time. I like to take a homemade pasta salad. I add mozzarella balls and cherry tomatoes along with all my other regular ingredients. Delish! My favorite dish is marinated sweet potatoes with caramelized onions and goat cheese on a multi grain bun - so delicious!! YUM! I think I need to win because I always bring dessert wherever I go, and any dessert would look so pretty in that set! A bottle of sparkling lemonade makes everything else in the picnic basket seem classy, no matter what it is. And I love throwing in the red-checkered cloth napkins I got at a bridal shower. Nothing says picnic like red-checkered gingham! Darling! My favorite picnic basket treat is either fresh fruit (berries or melon) or cheese & fresh bread. Delightful! Fruit is my favorite thing to take to a picnic. OOh! I LOVE picnics! That was my birthday gift to my boyfriend this year! We went on a picnic complete with kite flying and lazing on the blanket reading books! My favorite picnic dishes (sorry couldn't just pic one) are baked sweet and spicy chicken (cold) and my caprese salad (3 types of tomatoes in chunks, fresh mozzarella chunks, fresh chopped basil. a pinch of salt and cracked pepper, with a splash of olive oil and balsamic!). Yum!! Have a great weekend! I'm always looking for a reason to have a picnics, and with this set I could just pick up and leave and have a lovely picnic with no worries of forgetting plates, utensils etc! How fun and festive is that? My favorite items to take on a picnic would have to be simple things ~ like homemade sandwiches, chips, grapes, cheese, ice cold water and some yummy chocolate chip cookies. so is the giveaway over? did I miss it?? I've had my eye on this basket for a while now. I love everything about it. I love to do a long french bread sandwich for picnics. 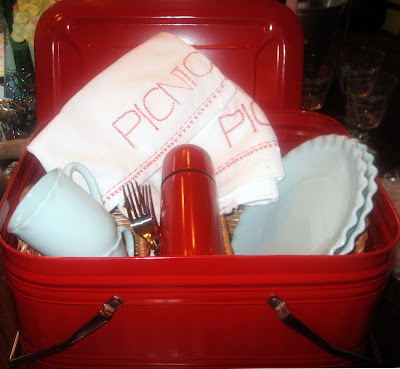 Love this red picnic basket! Cool giveaway!! i'm headed to a picnic this weekend and was thinking about taking some broccoli salad... though it looks like my sister mentioned s'more brownies.. and wouldnt those be good? 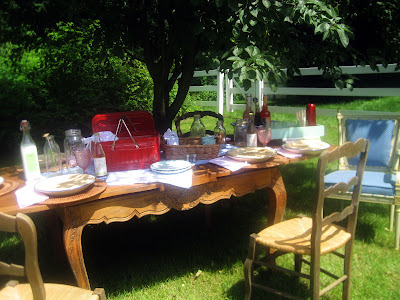 I have never gone on a picnik with a real live picnic basket, how dreamy! I imagine going with simple sandwiches, fruit and sparkling cider! Fresh fruit salad and Pellegrino on ice! That basket looks divine. I love to spend the extra time on a fancy pasta salad that I don't make often. It has fresh sweet peapods, zucchini, and a homemade viniagrette that is loaded with mustard seeds. Picnic season doesn't come to Arizona for another few months, but I would love to have a beautiful set like this to use in our mild November. Picnics make me feel like a kid again. I like to take along some childhood faves: pb&j, carrots, apple slices with carmel dip, and popsicles. I love picnics. My favorite item to bring is macaroni salad and some sort of treat. hmmm..good question. I haven't picnicked in years! But I've met someone special who likes to picnic..so I need to decide on a good picnic dish. All I can think of now is an American picnic (sandwiches, pasta salad, fruit, cookies) or a more European one (baguette, good cheese, fruit, wine). Would love to win the picnic basket + goodies to make this first picnic quite special. I would love to say I picnic a lot, but I really don't. However, I think every picnic should include good chocolate! Melons are required on any picnic packed by me. What a darling picnic set! My picnic-obsessed children would love it! I love your blog. I was surprised to find that you too live in ID. For a picnic, I always bring my mom's potato salad. Only potato salad I will eat along with my mother in law's. Right now I think I would have to say avocado, black bean, and corn salsa. It is delicious. I am in love with that basket! my favorite picnic dish is nothing special: a new fine cheese to try, fresh fruit, homemade baguette, and mom's homemade grapejuice. I love bringing some fresh thinly sliced prosciutto with sharp provolone on a crisp baguette. That with some pasta salad is scrumptious!! This is a beautiful picnic set! I love picnics! I love to bring finger food so that the kids don't have to stay seeted too long. Veggies and dip, chips and salsa, small sandwiches, fresh fruits... nothing too complicated! Fried Chicken, Fruit Salad and Rolls are my favorite. This is so perfect! My favorite picnic dish is cucumber rolls, with a canteen of mimosas. Yes, yes. I think I need to have a picnic this weekend! Thanks for the inspiration. oh, it's so pretty! red is my favorite color!! love love love this. my favorite dish to take to a picnic is pasta salad. it has curly pasta, apples, red and green grapes, celery, chicken, and cashews. it's yummy yummy. ok, i'm crossing my fingers + toes + anything else. i love this! i would love to make egg salad on hawaiian rolls to take on our picnic..yummy! That's so adorable! How picturesque! My favorite thing to take to a picnic is pretty simple...RICE KRISPIE TREATS! They just feel like Summer. They're so easy, but always a hit. I love to have homemade pasta salad at a picnic with fresh steamed veggies in it. My favorite picnic dish is an assortment of cheeses and fresh italian bread. Toss in some roasted red peppers, fresh pesto and garlic stuffed olives. Then for dessert I like to include some really good chocolate and some fresh fruit. Yum yum!! I love love love this picnic basket! We go on a picnic almost every weekend! In the mountains or on the beach, it a great time to spend with friends and family! My favorie dish is cranberry, cream cheese, and turkey crossaints! Let me tell you they are yummy in my tummy! =] Thanks for this amazing giveaway! This picnic basket is seriously great! I love to take chicken salad sanwiches!! So yummy! I could seriously just live on Brie and crackers....but I would be happy throwing some macaroni salad in there. I usually only take things bought from the store, because if a picnic is too much work, it isn't a picnic! But I make an exception for potato salad. Nothing says summer so well as going on a picnic, especially with a basket as gorgeous as that! I would love, love, love to have it. I would give it to my best friend, Emily, who lives in France and is currently battling breast cancer. We have big plans to go on a picnic together next summer when she is cancer-free. On the menu: freshly baked baguette, brie, grapes and strawberries, lemonade, and a bar of dark chocolate. Mmmmm! It would all taste even better in a basket that looks like that!!! I like to take caprese w/ sourdough bread or crackers and cheese. Favorite picnic dish... anything that will keep for the ride there. Seriously I love picnics and have been lusting after this set for ages! I'd fill the thermos with wine, pack a large wedge of brie, some crusty bread and an edameme salad...oh and probably some olives too. Now I'm hungry. my favorite picnic food is cowboy caviar and tostitos scoops. my sister got me hooked on it a few years ago. this picnic set is fabulous! a picnic isn't a picnic without potato salad and chips. Those plates are adorable! i think that chicken salad is a great standby picnic meal. So cute! I'm a fan of the good ole staple of sandwich, fruit, and crackers! I wish I could say I would bring something healthy, seasonal and beautiful, but truthfully fried chicken wins out everytime. My grandmother's fried chicken simply tastes like summer and childhood. And after all isn't that what picnics are about? I love those scalloped white plates! I'd love to win this--the husband wouldn't know what got into me if I actually packed us a picnic--winning this would be the motivation I need. I make a Farali Batta Baji, (potato, peanut, spice stir fry) which is my staple summer picnic food! Always a hit! My group of friends likes to get together and bring our picnics to Shakespeare in the Park. I already get made of fun of (in a good way) for my adorable picnic basket and pretty blanket, so the beautiful set you featured would surely make my life complete. My husband and I don't bring "dishes," we bring things to nosh on-- hummus, pita, veggies for dipping, fresh fruit, homemade cookies, and of course a bottle of red wine with wine glasses-- no styrofoam cups for us! At a picnic, I love a cold diet coke. well if that isn't the most stinking cutest most darling littlest cutest set ever. perfect to tote along to central park. hello awesomeness! my favorite thing to take on a picnic is smoked mozzarella pasta salad. it's heavenly. would love to take this on picnics near and far. i love to take grapes and cheese along on a picnic. i'm easy to please with picnic food - fresh fruit & a good sandwich. What a great giveaway. To me summer isn't really summer until I go on a picnic. It is one of my favorite things to do in the warm weather and this is a perfect set to take with you. My favorite dish to take when I go on picnics would have to be chicken salad sandwiches...my moms recipe is the best. My favorite is cole slaw from all homegrown ingredients and a lovely vinegrette instead of a mayo based dressing. My favorite thing at a summer picnic is watermelon. I could probably eat a whole one myself! I love the picnic set! I love Emigration Market sandwiches. They are the best! They would look so cute in this little picnic basket. And it's red: my favorite color! What a darling picnic set! White chocolate dipped strawberries are a picnic pack must for me and mine! I love, love this basket! One of my favorite things to take is yummy, juicy watermelon! My favorite picnic dish is Sesame Noodles that have been super chilled. I make them the day before so they soak up all the flavors. My fiance and I spend most weekends in San Francisco's Golden Gate Park, picnicking, reading and people watching. This basket is the sweetest thing I have ever seen! I need it! Fav picnic dish-I like twice baked potatoes, yummy! Some fruit, sunflower seeds, juice. Sounds perfect! What a fantastic giveaway! I like taking pulled pork and huge rolls to make sandwiches with. And fruit. Definitely fruit. Love a fancy cheese, baguette, some pears or apples and dark chocolate. Do it up Euro style! Love our fruit salad: grapes, mandarins, granny smith apples tossed with vanilla yogurt and lime zest! This would be perfect for late summer hikes. Thanks for the giveaway! favorite dish to bring to a picnic... it's nothing fancy but consist of a bowl overflowing with fresh seasonal fruit. nothing seems more refreshing on a warm picnic day. What a gorgeous and generous giveaway! I love a curried chicken salad with good cheese, a hearty whole grain (preferably homemade) bread, and some fruit for dessert. there is no doubt in my mind.. deviled eggs. what a sweet little basket. i really need to take grant on a picnic sometime. My fav picnic item to take is Trader Joes bruschetta and bagel chips! The ideal pincic dish: muffaletta. Not only is a delicious, jam-packed, meal-in-a-sandwich, but it is fun to say. j'adore le frozen bluberries! i eat them like candy and throw a few into my lemonade! I love to bring fruit salad, or watermelon cut in slices so that you can hold it in your hand and eat it. This picnic set is so awesome. Fantastic basket, and I hope you do a follow-up post with some of the recipes referenced in the comments. I think this is the first time in history I read all the comments! My pick would be oven-fried chicken made from an Epicurious recipe and fancy potato salad with artichokes, roasted red peppers, and no mayonnaise. anything sans mayo that doesn't require utensils: southwestern wraps, homemade oreos. sparkling lemonade. salt and vinegar kettle chips. Garden tomatoes, nectarines, cheese, and a baguette - something just right for a newlywed picnic! Now all I need is a picnic basket! picnics are perfect with yummy, fresh finger foods/fruits, something for the barbecue and a big huge blanket to lie on under an even bigger, more huge shade tree. and you must go barefoot, of course. I am a long-time lover of potato salad. It's a classic that I will always have a place for in my ... stomach. This basket is so adorable! My favorite thing to take on a picnic is a veggie salad that reminds me of NZ and my grandma. Fresh tomatoes, sliced cucumbers, and sliced onions all mixed together with balsamic vinegar, olive oil, and a bit of salt and pepper. Yum! Oh this picnic set is too adorable! And, I love that its red. :) My favorite thing to bring to a picnic would have to be a fruit salad medley. Bread & cheese. And olives. Is that a dish??? Ooooh I have a secret picnic spot that me and the hubby like to go to. This darling picnic set would be a perfect new addition! Thanks for all the fun summer giveaway's Mart! I always make a Quiche lorraine with good bacon and a fresh homebaked crusty loaf. I adore picnics, occasionally we just take our usual dinner out to a local park and eat there instead of at the kitchen table. this set is just perfect! my favorite picnic is cheese and grapes, just like you said! with some delicious crackers. My favorite is pasta salad. Definitely my mom's potato salad and some fried chicken to go along with it.Yum. i know there are already over 150 comments, but that picnic set is darling! how fun, a tin picnic basket, or not basket i guess -- picnic tin? anyway, my favorite thing to take on picnics: rice crispy treats! they don't melt (well, just get a little soft - but the perfect softness) and they're just the right amount of sweet to wrap up a perfect picnic! that set is absolutely amazing! my favorite thing to take on picnics is always potato salad - who doesn't love potatoes and being on a picnic feels like a good time to have something devilishly creamy. love it! picnics at the park are the kids favorite thing to do year round here. i have a great recipe for buttermilk fried chicken and a great simple salad that would be great at a picnic. i've made it for in house dinner, but never for a picnic. if i win, i will try it. my favorite thing to take on a picnic is chicken pasta salad. my girls love this salad with juicy purple grapes mixed in. i like plenty of icy cold drinks. love this picnic set! my favourite dish to take to a picnic is definitely potato salad. In fact I wish I was picnicking right now!! frozen lemonade and fresh pineapple! Mmmm... favorite picnic dish... pb&j's with some really good cherries on the side. And maybe some Jones sodas. I like to bring boursin cheese and a yummy baguette. I love chips and homemade guacamole and salsa and sparkling lemonade. I'm bad with time...I don't know if I'm late on this or not, but I'll try. For a picnic, I love lemonade and just a good sandwhich. i love all bite sized fresh fruit, so that's a must!! What a beautiful picnic set! I love the basket/bin thing. fruit kabobs, homemade chicken salad sandwichs on crossiants, and some sparling lemonade! Oh my! What a lovely set! Wouldn't Mr. Knightley be impressed if Emma packed cucumber sandwiches and tea in this bright red tin? My favorite picnic menu is definitely chicken salad on fresh baguette, grapes, black and white cookies and Aqua Panna! anything chocolate...such a fun basket!